This blog is dedicated to food and cooking. I enjoy cooking, eating and tasting great food. It doesn't matter when, where, what, why or how. As long as you are cooking, it is all good. In this edition of Food & Fun - Piney Woods, check out the following events. Click on the event for more details. June 1, 8, 15, 22, 29—LIBERTY: Liberty Opry Enjoy live, family-oriented musical entertainment with a different theme each week and a little comedy, too. Food and desserts available. At 1816 Sam Houston Ave.
June 8—JACKSONVILLE: Tomato Festival Enjoy motorcycle, tractor and antique car shows; sports tournaments; contests for salsa and tomato eating, peeling and mashing; a farmer's market; tomato shed tour; tomato shoot; live entertainment; history display; children's activities; and vendors offering arts, crafts and food. 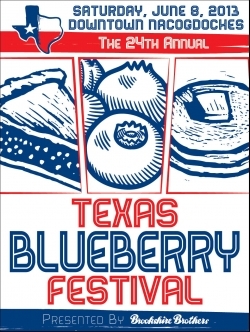 At 526 E. Commerce St.
June 8—NACOGDOCHES: Texas Blueberry Festival Texas' only blueberry festival transforms the downtown streets of the Oldest Town in Texas. At 200 E. Main St.
Have an Event You Would Like to Share? Let me know. Subscribe To Food and Flame!